Sitting pretty at the southeastern side of the Dajio Mountain is another star attraction of Guangzhou, China, the Nansha Tianhou Palace. Once an ancient palace, it was rebuilt in 1996 from utter ruins. Now, it features as one of the "must see" Guangzhou attractions. In fact, the place is so popular among tourists that the authorities open the palace at 8:30 am so that visitors can appreciate the scenic and architectural beauty of the palace in the broad day light. According to historical records, Guangzhou Nansha Tianhou Palace was built during the reign of the Ming Dynasty. Later, Emperor Qianlong of the Qing Dynasty renovated the structure. But political social and other turmoil caused the destruction of this palace. During its reconstruction in the 20th century, architects took care to keep its earlier style intact. The palace shows a combination of two distinct styles, which can be seen separately in the construction of the Forbidden City and the Dr. Sun Yat-sen Mausoleum. Nansha Tianhou Palace is the place where people come to show their respect to the Goddess of Tianhou. Locally, the goddess is also known as Mazu. As per legend, the goddess used to help shipwreck victims, and this led the locals to consider her as a reincarnation of the sea deity. The current area of the palace is about 100 hectares. Of this huge area, 1.5 hectares is popularly known as the Tianhou Square. You will have to pass through this square in order to reach the palace. The square is quite easy to locate, even from afar. 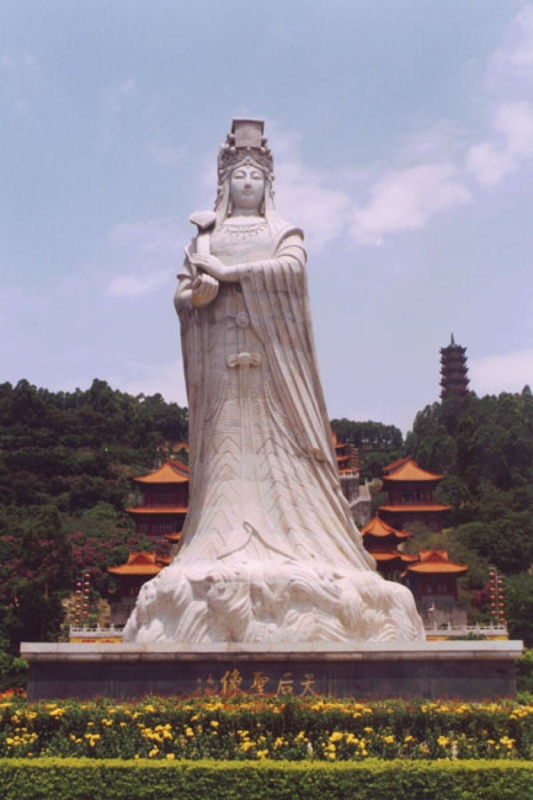 A huge statue of the Goddess of Tianhou stands in the middle of the square and works as a signpost. The structure is about 14.5 meters tall and made by using 365 pieces of pure granite. It is believed that thanks to idol of the deity, fishermen will have good catch while the city will experience great weather throughout the year. It is quite certain that even if you are acquainted with the words "clairvoyance" and "clairaudience", you have never seen the statues of those immortals whose names denote these supernatural powers. You get a chance to come across those statues at Nansha Tainhou Palace. The word "clairaudience" means someone who has the power to listen to the sounds that no normal people can hear. The statues are located at the main door of the palace. Once you step inside the Hall of Blessings you will find another statue of the goddess, and this is the main chamber where the main worship takes place. The statue is also surrounded by the structures of four dragon kings that are believed to be the protectors of the deity. In the Main Hall, you will find two more statues of the goddess. There is also a third hall known as the Resting Hall. The Tianhou structure at this place is in the sitting position. There are a few other structures in this palace that you should not miss. The 8 storied and 45 meters high Nanling Tower is one of them. There are four forts here known as Dajiao Mountain Forts, which are also noted in the list of national priority cultural relic protection sites since 1982. Now, you know why you should include Nansha Tianhou Palace in your sightseeing plan.